Everyone knows how delicious a cold beer is with a juicy burger or a plate of nachos. But have you ever considered what might happen if you used the beer to actually make the very same burger or nachos? Just think – a half cup of Guinness added to your burger patties or a bit of light ale in the queso on your chips and you could be that much closer to beer-food nirvana. And burgers and nachos just scratch the surface of the beer-in-food possibilities – if there’s a recipe for it, chances are that somewhere, sometime, someone has tried adding beer to it. Sure, not all of these attempts have been tasty, but we’re pretty sure that some of them are worth repeating. With that in mind, we’ve collected twelve recipes for dishes made with beer that are improvements on the originals – check them out below and find ways to use beer in everything from lobster to marshmallows. Take note – the same rules that apply to cooking with wine apply when cooking with beer – cook with something you’d be happy to drink. Using beer that you don’t like will most likely result in food that you don’t like, so don’t be a cheap skate. In case you happen to make that beery burger we mentioned above, you’ll probably need something fried and salty to go with it. 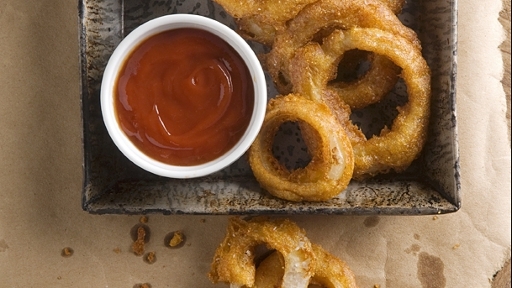 We say, why not go all in and make these beer battered onion rings? These thick cut rings from Cheryl and Adam of Picture Perfect Meals are both light and crispy from a mixture of cake flour and cornmeal in the batter. Use the beer of your choice and a little bit of chili pepper to add flavor, fry them up, and they’ll be gone in no time. This super simple, savory quick bread has got a lot of different flavors to recommend it – bacon, chives, your favorite beer, and a bit of melted butter just to round things out. 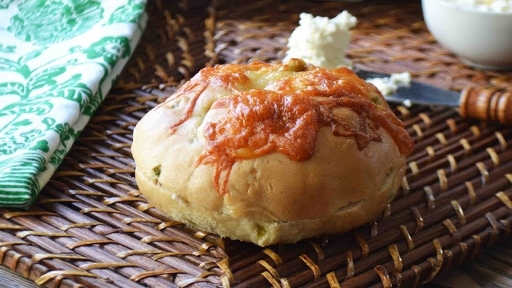 Kristin of the Pastry Affair recommends serving this bread with a big bowl of hearty chili, making a satisfying meal for dreary early spring nights. It only takes a few minutes of bacon frying, 5 minutes of stirring and 45 minutes of baking before this bread is ready – meaning, if you start now, you could be eating it in less than an hour. Hop to it! Don’t think that just because they’re vegetarian and vegan that these mushroom pot pies aren’t satisfying – they’re filled with all sorts of umami packed ingredients, including soy sauce, kalamata olives, balsamic vinegar, and of course, dark and heavy stout beer. 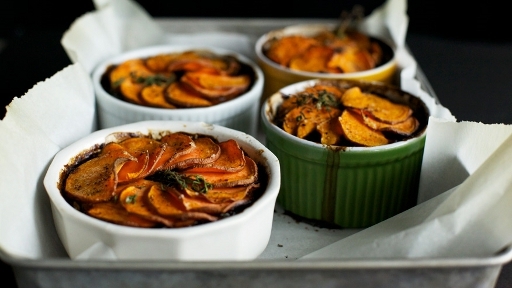 Instead of a traditional biscuit crust, Laura of The First Mess takes the health impact of these great little pot pies one step further by using thinly sliced sweet potatoes to top them off. As the pot pies cook, the sweet potatoes crisp up lightly around the edges, adding a little crunch to this hearty and healthy meal. The hardest part of making this delicious, meaty soup is waiting the four hours it takes to come together in the slow cooker. Other than that, all you have to do is add some pork, veggies, chipotle, black beans, and two bottles of Dos Equis to the pot, then sit back and let your house fill up with good smells. When the soup is (finally) ready, top it off with sour cream, salsa, and cilantro, and crack open another beer to go with it. First of all, let us just mention that Jackie, the author of The Beeroness, writes an entire website (soon to be turned into a book!) dedicated solely to cooking with beer. If you like the recipes we’ve mentioned here, you’ll find infinite amounts of inspiration over at her blog. 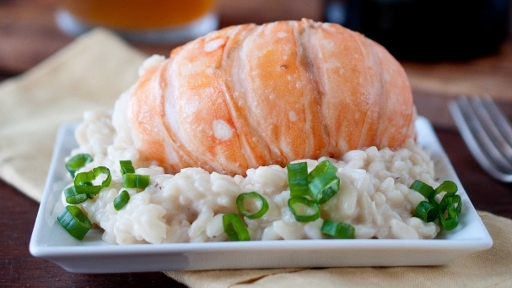 Now – lobster, risotto, and… beer? Who knew that beer could be so classy! Jackie uses Saison beer to poach lobster tails and whip up a creamy risotto, making what might be the most elegant beer-infused meal we’ve ever seen. If you’re looking to impress a beer-loving date, this should definitely be your choice for dinner. Good BBQ is all about the sauce. Whether you like yours sweet or tangy, complexity is always a good thing, and Chrissy of Stick A Fork In It has upped the complexity of your favorite sauce by adding a cup of beer to the mix. 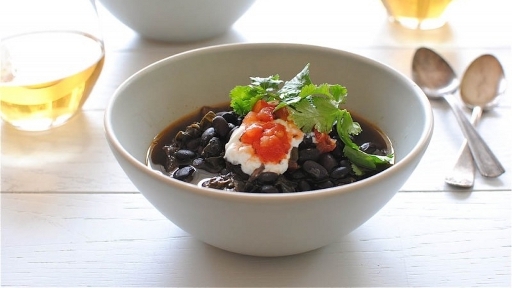 This is another slow cooker recipe, and it’s about as easy as they come. 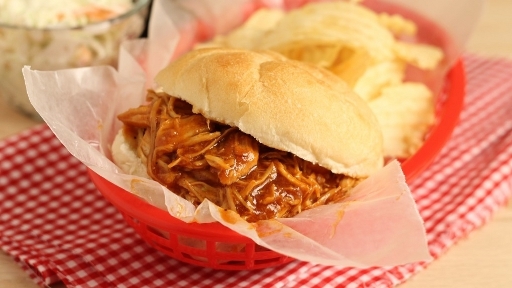 All you have to do before serving is shred the chicken and toast some Kaiser rolls to sop up the deliciousness. 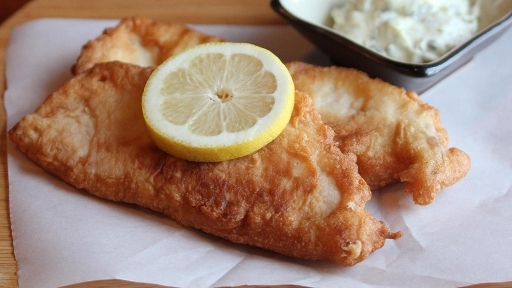 Beer batter isn’t only good for onion rings – it also makes for a crispy on the outside, moist on the inside piece of fried fish. Lisa of Lisa’s Dinnertime Dish uses the batter to coat mildly flavored Tilapia for a delicious dinner. If you’re feeling adventurous, make her homemade tartar sauce to go with it – it’s an easy combination of mayonnaise, capers, relish, lemon, and herbs, and it really completes the meal. We’ve already established that cheese and beer is a great combination – nachos and beer, pizza and beer, cheeseburgers and beer. So a soup where the two primary ingredients are cheddar cheese and pale ale seems like a logical next step. 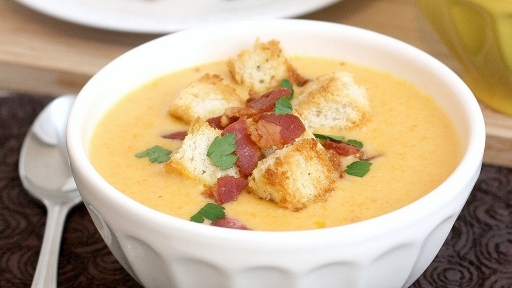 This soup also manages to pack in lots of other good flavors, like bacon, worcestershire sauce, and homemade croutons. It’s easy to imagine how incredibly addictive this soup might be on a cold night – it might be hard to stop after only one bowl. We’ve talked a lot about the use of beer in savory recipes, but it also makes an intriguing addition to desserts. With the right beer, particularly something dark and sweet, beer and chocolate can make a great pairing. 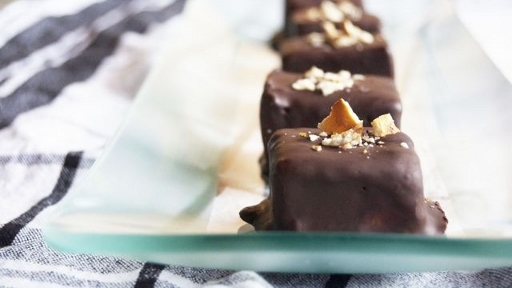 Beth takes advantage of this combination to make Guinness flavored marshmallows, which are then coated in dark chocolate, crushed pretzels, and coarse sea salt. Making marshmallows from scratch can be a bit tricky, but the resulting confections so outshine store-bought marshmallows that it’s worth the effort. Once you add the chocolate and salt, a box full of these grown-up marshmallows would make an amazing homemade gift for any beer lover. 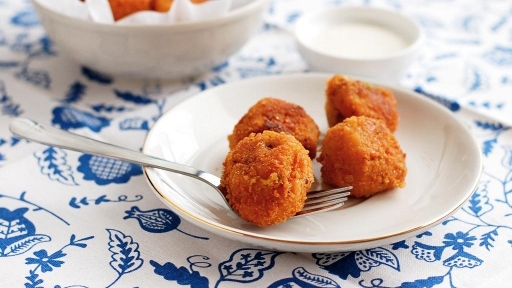 There’s something irresistible about bite sized, deep fried, potato and cheese bites when you’re sitting at a bar with a cold glass of your favorite beer. Thanks to Nicole, now you can recreate that experience at home and even take things one step further by adding beer to the cheesy tater tots themselves. These little guys also have bits of bacon, green onion, and a coating of Ritz crackers to up the ante. We’re avoiding making them until we absolutely can’t resist, since we know they’ll be gone in a matter of minutes once we’ve fried them up. Beer for breakfast? 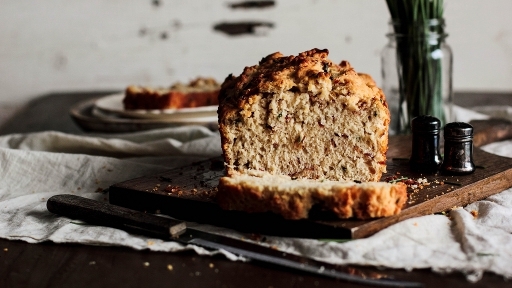 If we can fool everyone by putting it in our bagels, we’re in. Carrie of Bakeaholic Mama shows us how to accomplish this by using beer to replace the water in a standard bagel recipe, and then mixing in sliced jalapeno peppers for a bit of a kick. After they’re boiled, she sprinkles them with cheddar cheese and pops them in the oven, pulling out a cheesy, spicy, beery treat 20 minutes later. Now that we’ve seen these bagels, we’re imagining all sorts of uses for them – bacon, egg, and cheese on beer-jalapeno, anyone? 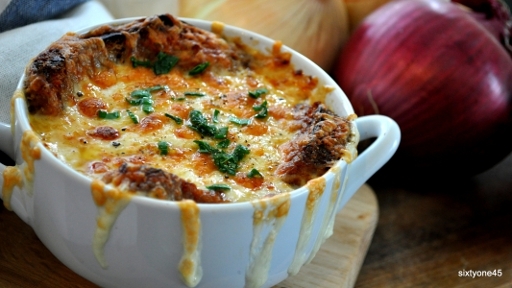 Classic french onion soup is a deeply rich, wintertime treat, that combines slow-cooked caramelized onions with white wine and beef broth, and is finished off under the broiler with a layer of baguette and melty Gruyere cheese. Lisa of SixtyOne45 plays with the classic recipe by swapping out the wine for dark beer, using three different types of onions, and adding balsamic vinegar and agave for complexity and sweetness. From the looks of it, this recipe is going to give the classic version a serious run for its money. A strategy consultant by day, Katie Morris uses recipe development, food writing, and food photography for her blog, Katie At The Kitchen Door, and other online publications as a creative escape. When not dreaming up new ways to incorporate bacon and chocolate into every meal, she spends her time running, practicing ballet, and gardening with her wannabe-farmer boyfriend. Based in Boston, she's a New England girl through and through, and is always looking for new places to explore.